Food Adventures of a Comfort Cook: Pies Aren't Always Sweet. When you hear the word pie, often times your mind thinks of something sweet such as fruit pies or perhaps a rich cream pie with a mile high meringue topping. 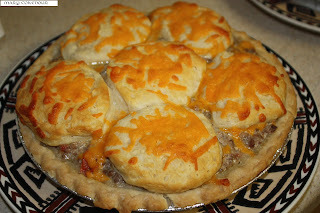 Pies can be savory too containing some type of meat and vegetables like Shepherd's or Cottage Pie or even sausage with peppers and onions can make a great filling in a pie crust. Now how about taking an American classic sandwich, such as the Cheeseburger, and making that into a pie? 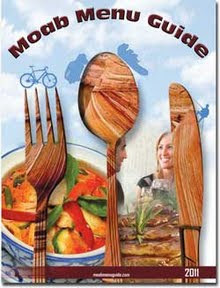 Yes, it can be done; just check out online recipe sites or basic American cookbooks such as those put out by "Taste of Home" magazine. Trying to come up with something new for dinner one night, I decided to try my own version of a cheeseburger pie. Roy and I discussed what we like on a typical cheeseburger; simple items like cheese, of course, lettuce, tomatoes, ketchup, mayonnaise, horseradish mustard, grilled onions and/or mushrooms. Now how to make this into a pie of some sort and have it be edible; however we both didn't like all the items on one burger, so needed to compromise. The first attempt wasn't very successful, too bland and if reheated, it was worse. The filling was also too mushy, so the addition of a binder was needed. The second attempt came out much better by adding some leftover ingredients from an Italian meal I made, plus using eggs as a binder...sort of like you would with a quiche. I do intend to play more with this recipe eventually, so don't be surprised if you see an update at a later time. Preheat oven to 350F; if refrigerated or homemade crusts, place in 9 inch pans; place pie crusts in oven for 5 minutes to set dough. In large skillet, medium-high heat, brown beef; add Italian herbal mix, garlic, onion and mushrooms halfway through browning. Drain excess grease. In large bowl, mix together beef mixture with tomatoes, tomato sauce, ricotta, 2/3 of the cheddar cheese, eggs, salt and pepper; mix thoroughly. Divide between two pie pans. Divide 6 of the Grands biscuits to form 12 thinner biscuits; press the 1/3 of the remaining cheddar cheese onto one side of the halved biscuit dough. Place 6 on top of each pie (1 in center, 5 around), cheese side up; bake for 20 minutes; let rest for 5 minutes before serving. Makes 2 pies; 6 servings in each.